"One of our family's all-time favorites. Make it as spicy or mild as you please. It is hearty on a cold winter's night. If you are cooking for a crowd, this recipe can easily be doubled. 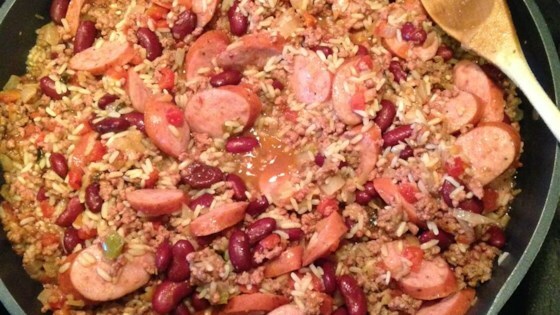 Be sure to serve this with cornbread!" In a skillet over medium heat, brown the ground beef, sausage, and onion; drain. In a large pan, combine rice mix and 2 cups water. Add diced tomatoes and chilies. Stir in the kidney beans. Bring to a boil, then add meat mixture. Season with salt and pepper. Return to boil, reduce heat, and cover, stirring occasionally. Cook for 25 minutes, until rice is easily fluffed with a fork. Great addition to my pre-Mardi Gras party. I cooked it in a crock pot to finish the rice and it was terrific. The flavors were great and not to spicy for non-cajun eaters. This is soooooo good. We had a Fish Fry and I made this. Everyone raved about how good it was. I used Chicken Broth instead of water and the rice was very flavorful.